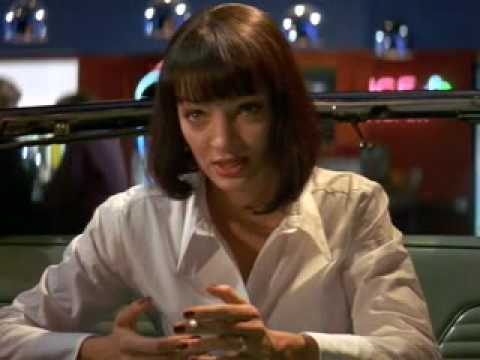 We’re all familiar with the ludicrously interconnected universe of Quentin Tarantino. If you’re not, then read up, because today we’re not scouring through theories about Vincent Vega’s brother’s uncle or just what the hell was in that briefcase, we’re taking a look at some of the coolest and most obscure Tarantino film Easter eggs, secrets, references, plot continuities, and bits of trivia we could find. From hinting at character betrayals with soap bottle placement in Reservoir Dogs to sneaking the audience an explicit message on the bottom of The Bride’s Pumas in Kill Bill, Tarantino has clearly mastered the art of subtlety and doesn’t even come close to stopping there. Quentin built his entire career on knowing movies better than most any other filmmaker in Hollywood, and the references and homages are abundant in his films if you know what you’re looking for. Even Django Unchained itself was a blatant homage to the original ‘60s western Django - and that one’s just right there in the name. Without further adieu, here’s our list of the best Easter eggs from Tarantino films. Make sure you cast your vote for your favorite hidden gems and Easter eggs on the list, and let's get to the bottom of that briefcase business in the comments section! Vic Vega (Michael Madsen) from Reservoir Dogs and Vincent Vega (John Travolta) from Pulp Fiction are brothers. Was this a cool Easter egg? When Nick Fury, played by Samuel L. Jackson, "dies" in Captain America: The Winter Soldier, his headstone reads: "The path of the righteous man: Ezekiel 25:17." This is a direct reference to Jackson's famous "Ezekiel 25:17" speech from Pulp Fiction. In Kill Bill, O-Ren Ishii claims that The Bride "may not last five minutes" in a fight with her. It takes The Bride exactly 4 minutes and 59 seconds from the music cue to kill O-Ren. Mia Wallace talks about the TV pilot she shot called Fox Force 5 and it's basically the plot of Kill Bill.